Alexia has heard horror stories about hair loss and wants to avoid becoming a bald black woman. She is a 45 year old stylish black woman; her business and social demands make it absolutely necessary that she keep her hair neat and well groomed at all times. She keeps her weekly or every two week appointments with her hair stylist/beautician/hair dresser and feels that the investment she makes for hair care is well worth the cost for the attention, esteem, and good feeling that she gets when others complement her on her hair and when she looks in the mirror. While she only goes to the best hair dresser and only uses the best products, something has gone wrong. Her hair is coming out excessively and she is experiencing moderate to severe itching as well as flaking and irritation. She wonders, "Am I becoming a bald black woman?" She has followed her stylists’ suggestions, tried every oil, including olive oil, mayonnaise, castor oil, you name it, but she has still been unable to get any relief. Her best friend recommends a new hair stylist, so reluctantly, Alexis sneaks away from her usual stylist (she tells her she is going on a prolonged work assignment out of town) to give the friend's stylist a try. At first things seem to be going great, the itching stops and the flaking stops, but the hair shedding is continuing but Alexis doesn’t mind since her scalp feels better. Out of the blue, during one of her visits to this stylist, she casually mentions to Alexis that she might want to consider getting a hair piece to cover this bald area at the top of her scalp. Alexis questions her, “What bald spot?” I have been coming here every week and you never mentioned a bald spot or hair loss before. She is informed that the spot was beginning when she first came in, but now it was 3 or 4 times as large and needed to be covered up. Alexis is distraught and lost and frightened and doesn’t know what to do. She has now become a bald black woman. Out of desperation she calls her previous stylist and schedules an emergency visit, since she had an unexpected return trip home from her out of town work assignment. At the time of the visit her former stylist is in a state of shock and asks Alexis, “What happened, you never had this hair loss before”? You were never a bald black woman, before. Well there are a lot of ways this story could end. Here are a few possible scenarios. 1. Alexis is directed to a dermatologist who diagnoses alopecia areata and either treats the area in the office or by prescription medications that are used at home and the hair grows back in a few months. 2. Alexis goes to the dermatologist who takes a skin scraping and diagnoses tinea capitis or ringworm infection (acquired from Alexis’ 2 year old grand daughter), prescribes oral and topical medication for 4 weeks and the condition is cured. 3. Alexis goes to the dermatologist and is informed that she has an area of scarring and needs a scalp biopsy to check for discoid lupus, lichen planopilaris, or central centrifugal scarring alopecia. Since these conditions may cause permanent baldness and continue to spread. It is emphasized that early diagnosis and treatment is important to prevent severe hair loss. In actuality, Alexis was found to have a fungal infection of her scalp and it cleared readily with appropriate treatment and her hair grew back and the itching never returned. She is no longer a bald black woman. She has since kept her weekly visits with her original stylist since she told her that she got transferred back to town from her imaginary out of town job. A couple of years later, Alexis noticed something different about her best friends’ hair. She asked her “What was going on?”. The friend replied that she had been getting a weave done at the top to cover a spot, but over the years she needed more and more hair to cover it, so she had decided to shave all of her hair off and get a lace front. (cicatricial alopecia) and had lost 50% of her hair which would never grow back. This is one of the more common diagnoses causing a bald black woman. She was asked why didn’t she get treatment years ago, and her only reply was that she thought it was just a little spot and covering it up was ok…. 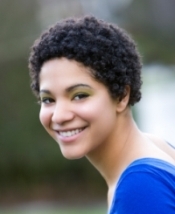 Thus, she was faced with covering up her baldness for life and never wearing a natural hair style again, unless she was willing to expose the area without hair. This is a hypothetical presentation about bald black women and is not based upon any specific person. Any resemblance to an actual person is purely by chance or coincidence. It is only meant to illustrate possible scenarios that lead to bald black women. If you experience hair loss or scalp irritation, see a dermatologist today! Stress or Thyroid Problem makes your hair fall out?